From the old forum...here are the measurements for the Sportone trim holes on a 2dr hd top model..The 4dr will be slightly different. 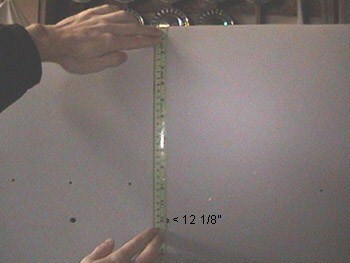 This is the hole that the little 45 degree elbow piece is fastened to.Below shows the horizontal measurement from the edge of the fin to the center of the hole. 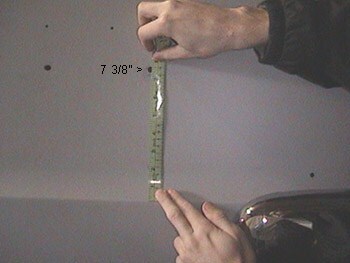 13 5/8" The second picture is just a close up of the reference point I used to obtain the measurement. 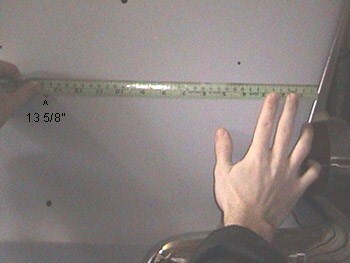 Note that the tape measure is not wrapped around the curve of the fin. 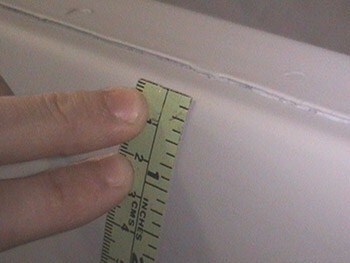 Just to assure accuracy, the distance from the hole down to the crease in the quarter panel is 7 3/8"
1 3/4". 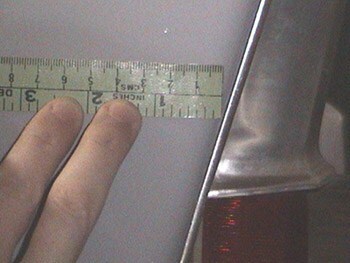 For accuracy reasons, note that the tape measure is pressed flat against the panel and follows every curve in the sheetmetal. The horizontal distance from the edge of the fin was a bit tricky to measure and came to 3 1/8"
Thanks for posting this Wayne. I'm still contemplating converting my 57 so this will be most helpful if I decide to do it. I saw a '57 with Sportone insert along the '57 trim pattern (without the hockey stick portion on the quarters) it looked great. So picture on yours instead of the dark red stripe, there would be anodized aluminum. Would be a neat project. Joe, do you remember where you saw it? It was a red on red modified Belvedere with. a 440 on ebay. It's no longer there but I found the car. Glad to help guys. There's a lot more info and I'll be moving it over slowly and adding to it over time. Now that you mention it Joe, I have seen that car before. I'm still just toying with making any modifications at this time cause I'm torn between wanting my car to look like a 58 and my reservations toward making alterations from stock, not to mention the cost of parts but I am partial to the "hockey stick" upsweep trim. It really compliments the shape of the fins in my opinion. Me too. I like 'me both. Wayne im glad you migrated that over here. I will need to look at this when the time comes. Chris I would go for the up sweeps! Sweeps are cool! Big 'M' makes the elbows and I think the sweeps now from the piece of the upper wide sport tone trim you cut off of the '57. The lower sport tone will have to be grafted to a straight piece. Marc.